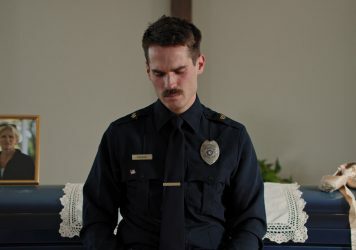 Thunder Road opens with a long take of a uniformed police officer performing a humiliating eulogy for his dead mother. His emotions continually get the better of him as he grins, breaks down and rages. It all leads up to a jaw-dropping dance sequence that someone records and uploads to the internet. Based on a short film of the same name, this scene sets the tone for the extended breakdown and redemption of a man struggling to hold his life together. Written, directed, produced by and starring Jim Cummings, the film examines the life of a man who just can’t fit in. It feels like a convergence of internet meme culture and a changing compass in American values. As it explores issues related to police brutality, the opioid crisis and the patriarchy, it examines the personal damage of viral humiliation and cyclical violence. Without being overtly about internet culture, Cummings’s background and understanding of how online communities operate and propagate ideas make Thunder Road one of the most culturally and politically reflective films of the year. LWLies: In your short film you use Bruce Springsteen’s ‘Thunder Road’, but in the feature, you don’t. What motivated this change? Cummings: We shot the short film without permission. I didn’t think that it would be anything more than like a viral video of a dancing cop. At best, this could get a Vimeo Staff Pick. Then we submitted to Sundance and we got in. I thought, ‘We might never be able to put this online.’ Then we won Sundance and I realised, ‘We’re never going to be able to do this online because we don’t have the rights.’ I spent about three months trying to get in touch with The Boss, going through all of these organised pathways that were just telling me no. At that point, we wrote an open letter. What’s the worst that can happen? In two days we got a call from Bruce’s lawyer saying he had seen the short film. They asked us for a thousand dollars to put it online and the promise to not write another open letter. With the feature, we shot it both ways. First, we shot the funeral with the song and then without it. If you frontload a lot of the fulfilment you end up losing the audience. If we had the song in the feature, it would just be this like really fulfilling short film that opens the movie. Without the song, it is so deeply humiliating. It makes sense his daughter doesn’t really like him that much and you have him regain that dignity throughout the feature. You have a background at College Humor creating videos. When making this film are you thinking about the Internet audience differently than a film audience? I grew up doing viral videos as a producer of music videos for a rapper named Lil Dicky and made three or four of his music videos and had thousands of conversations about how do we win over an audience in each moment. I’ve been on Reddit for about eight years and that helps me understand what people actually find funny and moving. A lot of like my siblings make fun of Reddit because they see it as like the reason why we lost the election. But it’s the third most visited website in the United States. It’s unbelievable, and it’s just an extension of the human brain. It fills the prefrontal cortex with cute rabbit images and then, like, Public Meltdowns. Then, watching stuff by Mike Judge or Armando Iannucci – or any of my heroes – I saw there’s a way to do comedy and humanity. You have the character Nate, Jim’s partner, who is the real anchor of the film. How did you kind of craft his character? In Austin, at SXSW, a bunch of tough guys were coming out of the movie and they’re like, ‘Oh man, the movie made me cry.’ I ask where, thinking it’s the ballet scene at the end, and they say when he walks back to hug his friend. I’m like, ‘Why?’ It’s not the most moving moment, but tough guys love it. The guy who plays Nate [Nican Robinson], he’s actually a friend. We have this genuine relationship of caring for one another. We talked about what it’s like to have a really good friend or a brother; just a group of people you can have fun or get drunk with. It was mainly like bullshitting and joking until somebody goes through a divorce and then they’re sleeping on your couch and you’re helping them go through hell. When somebody is going through something, you end up breaking that surface level of social friendship and you find out who somebody is and love them as a human. It’s beautiful that these guys who are relatively inept at talking about emotions are able to find and care for each other. When you’re writing the script and then you’re performing it after, how closely is it? It’s almost identical. The only words of improv in the funeral scene are me saying, ‘We got people here.’ It’s extremely rehearsed. With the other actors. I’ll record the whole screenplay as a podcast and then put in sound design and music so that we can hear the movie and I’ll act out every character and send it to the cast and crew. By the time they get to set or rehearsal, they already know what I’m thinking for the scenes. Then it’s their job to elevate. 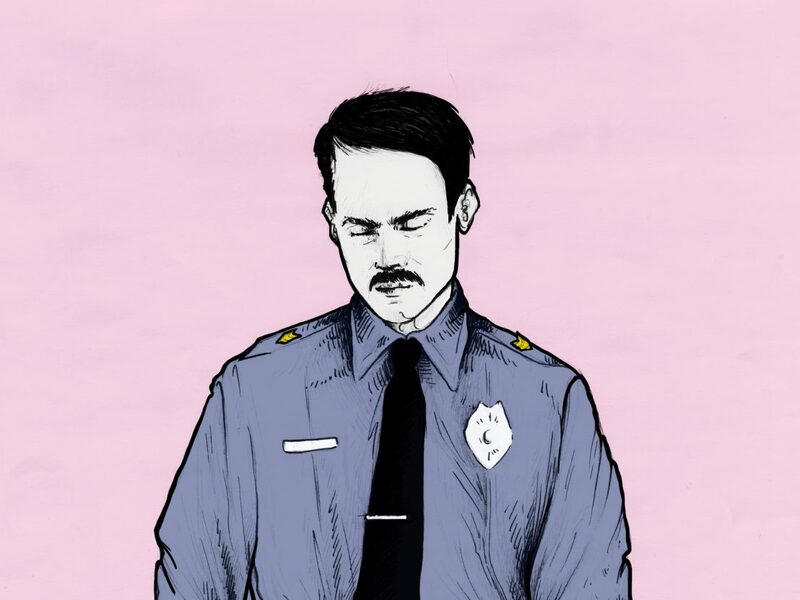 Thunder Road is among the first films to win Sundance’s creative distribution lab. Can you explain how that works? We applied for the grant immediately after winning SXSW and having no offers from distributors. If nobody helps us out, we were going to do this ourselves. We applied and they gave us $32,000. They have put out five movies before and they have all this data of what works and what doesn’t. Some of it was literally us calling different theatres and being like, ‘Hey, we made this movie, it won SXSW, can give us a screen for a couple of weeks?’ By ourselves, we booked about 40 theatres in the United States. Then we want to Deauville American Film Festival in France. We won the Grand Prize and opened in French theatres. Just there we recouped twice the budget of the movie. We just had this perfect formula to accidentally engage French audiences. It’s crazy to think that if I wanted to I could move my company to France and make movies exclusively for them for the next 80 years. Thunder Road is released in US cinemas 30 October.